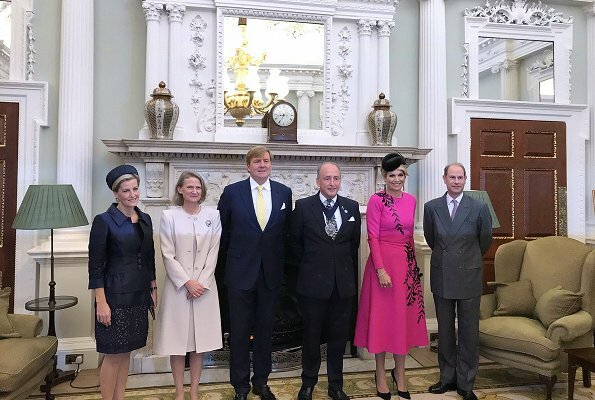 In the afternoon, the Prime Minister, Theresa May, received the King and Queen for lunch at 10 Downing Street. The state visit ended at Buckingham Palace where the King and Queen took leave of Queen Elizabeth II. Sophie looks spectacular! Excellent choice of hardware as it adds height. 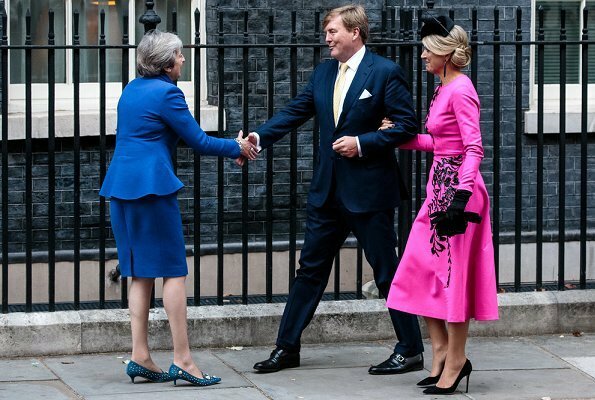 Queen Maxima has such long legs that I prefer when she wears longer hem lines. I’m not a fan of the ornate pink dress but do like how if fits her. I think she looks regal here. These two ladies really seem to enjoy each others company, both so friendly and outgoing. 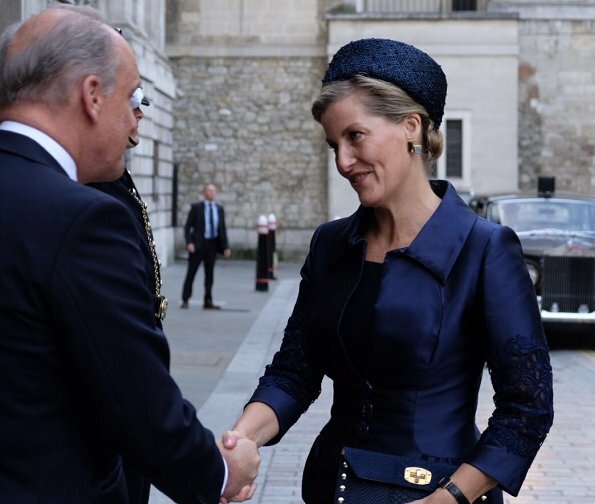 Sophie looks wonderful today in the navy, love her hat. 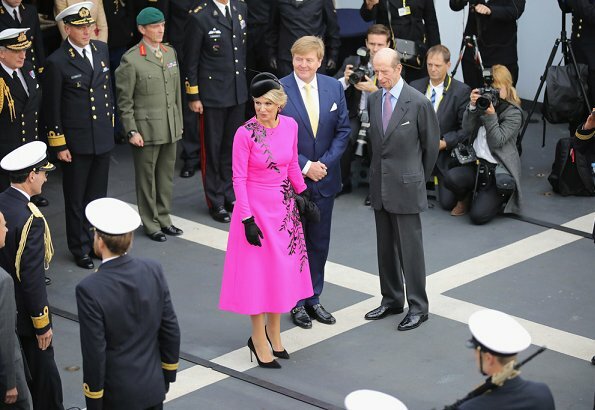 Maxima's dress is too bright for my taste. But her dress fits well and her hair is styled nicely. What a nice duo! They had much fun today, lovely to see both couples get along so well. I love both outfits very much. They match their personality's, I guess. Nice to see an Oscar de la Rente. The bright pink and the black match so well! Back to Maxima Business: Maximum COLOR!! Wow! This is the best outfit I've ever seen Sophie in! Well, the dress is a bit short but who cares when you look this smashing at the age of 53! Maxima is OK. Colorful as usual but a little old fashioned. I agree, one of Sophie's best outfits. Navy blue is very nice color even for her. Maxima is ok, not my favorite color, not my favorite dress but her smile is always so wide and warm that you don't even see what she has on. Both ladies look stunning. 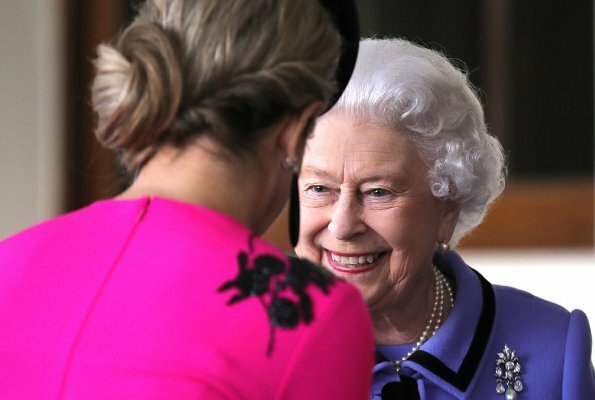 QE2 eyes are smiling and her majesty seems happy. Well Oscar De La Renta today. 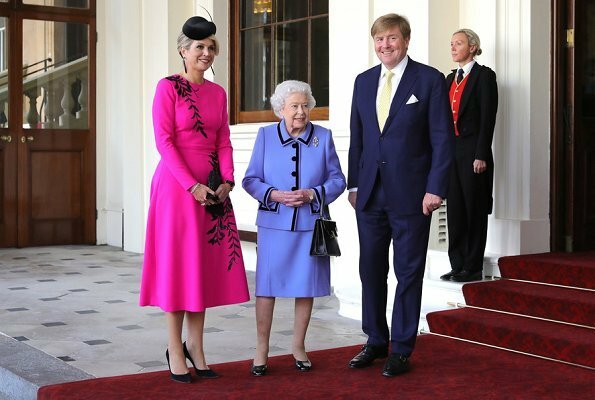 A very nice dress,Maxima looks very good in it.Love the blue suit from Sophie, bur it seems a little tight. Her hat and hair look wonderful, from both Ladies. Ehe Queen looks good in any color. Well Oscar De La Renta today. 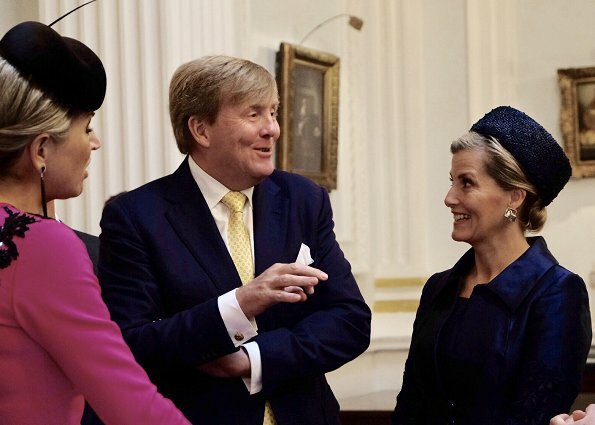 A very nice dress,Maxima looks very good in it.Love the blue suit from Sophie, bur it seems a little tight. Her hat and hair look wonderful, from both Ladies.The Queen looks good in any color. These pictures just look so warm and inviting. They are all getting along so well. 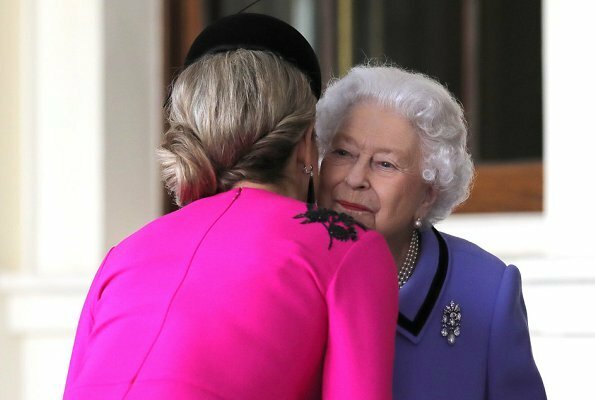 Sophie and the queen epitomise classic and tailored British elegance. Maxima, vibrant as ever looks fantastic. Everyone looks like they really enjoy seeing each other. 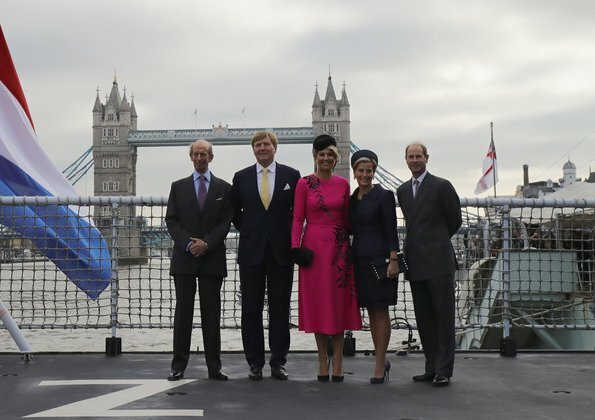 Even Queen Elizabeth looks happy to see Maxima. Sophie looks terrific. Best I've seen her. Maxima looks great in her usual bright colors. 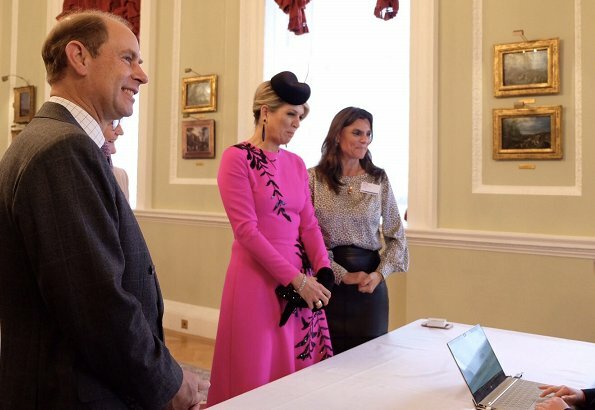 As usual Maxima wants to be the center of attention with the bright pink dress black gloves and silly hat. 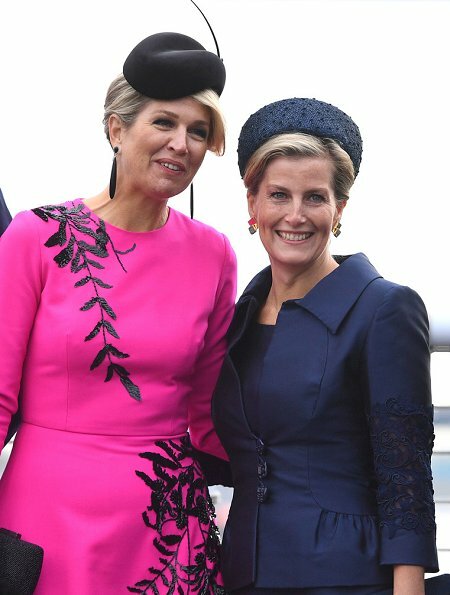 Sophie looks very elegant and beautiful, Maxima hasn't learned that less is more. Nin Pujol, why so judgmental? It's OK not to like the way a person dresses, and to offer critique about fashion, but your comment is very derisive, and of course subjective. No need to be rude. It's apity that the black motiff is interrupted at the waist. I think it would look better if the pattern is continued through the waist down without interruption. All the ladies look great here. Sophie is the best for me. The color looks great on her, but I would love to see a couple of inches on her skirt. I really love her hat to complete her outfit. Maxima's look is more sophisticated than many she has chosen in the past. 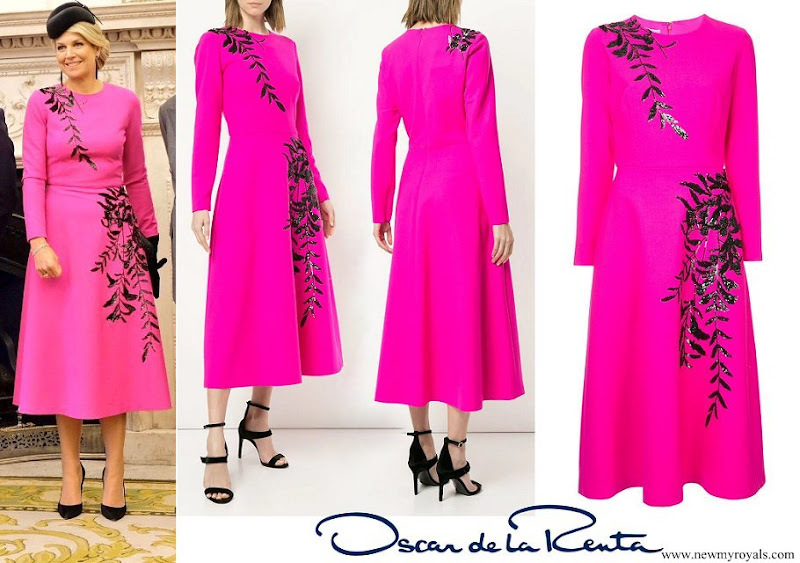 Oscar de la Renta is a better choice of designer than her usual go-tos. Her hat is a more appropriate size for the visit as well. I think she needed the color to still be "Maxima". 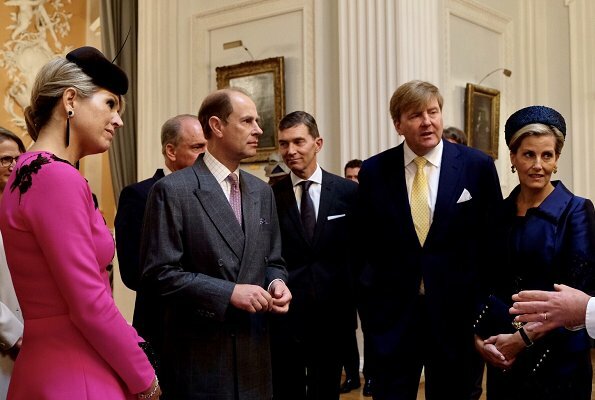 I enjoy seeing the Queen in a suit. She really looks lovely. It is a nice change from her coat dress. Maxima looks great - love the colour and style. Her hair is very chic here. Sophie also looks wonderful - love the outfit and can't see what the problem is with the length.